We deliver a highly professional service. Our highly qualified plumbers have extensive experience in solving all domestic plumbing related problems, from repairing a set of taps or repairing a leak, to creating a beautiful bathroom. We will keep you informed every step of the way with honest, down-to-earth advice. We work with all major brands of boilers, including Vaillant, Worcester and Baxi. We can repair or install replacement boilers and all associated components, including a full control package to suit your requirements. Advice is given freely on energy saving measures to help cut your fuel costs. Boiler servicing is about safety and efficiency. If a boiler is serviced annually it could save as much as £100 on energy costs as well as highlighting any potential safety issues with the appliance or pipework installation. Bathrooms need to be a relaxing place to escape to and unwind. We aim to design a beautiful and fully featured bathroom to perfectly meet your requirements. With a large selection of products available from baths and shower cubicles to shower valves and taps and an endless selection of tile designs, there really is something to suit all tastes. Having built up a good customer portfolio over the last twenty years, I know we can help you with your plumbing issues. We have qualified engineers who always offer professional and impartial advice. They arrive in a timely fashion and are always professional, presentable and clean working. 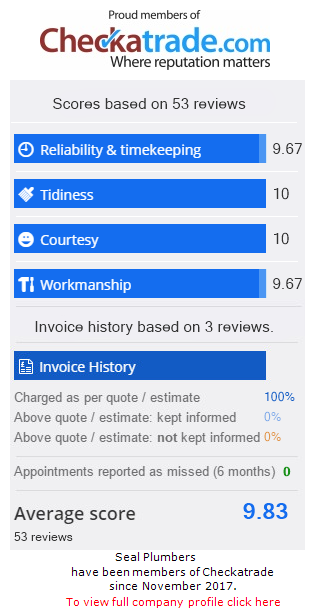 Our reputation is extremely important to us, and the vast majority of our custom comes from existing customers and recommendations. We strive to build a lasting relationship with our new customers. We offer superb value for money, with an hourly rate for emergency response and a full, free quotation covering the entire cost of the work for non-emergencies. Our aim is for you to feel you have booked a plumber you trust.